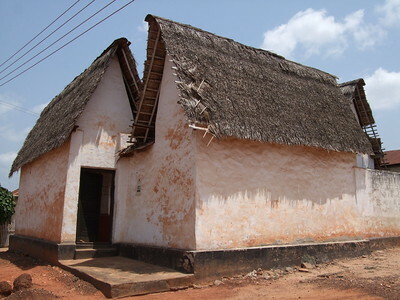 The Asante Traditional Buildings are the only surviving examples of traditional Ashanti architecture. Their design and construction, consisting of a timber framework filled up with clay and thatched with sheaves of leaves, is rare nowadays. All designated sites are shrines, but there have been many other buildings in the past in the same architectural style. They have been best preserved in the villages, away from modern construction and warfare. The WHS consists of a number of buildings (10, 12 or 13?) around Kumasi in central Ghana. Kumasi was once the capital of the great Ashanti Empire. The buildings consist of four rooms around a quadrangular courtyard. Three of the rooms (those for drumming, singing and cooking) are open, while the fourth (the actual shrine) is closed to all but the priest and his assistants. The inner courtyards are usually littered with fetishes. The shrine is home to Obosomfie, the spiritual abode of a deity, who manifests itself through a fetish priest. Some of the enlisted buildings still have priests, some don't. The buildings traditionally have steep thatched roofs. Their lower walls are painted orange/red, and the upper walls are whitewashed. The walls hold symbolic murals, like those on the adinkra cloth. During my stay in Kumasi, I hired a driver for the day and we went on a tour across the surrounding countryside. There are a couple of interesting craft villages to visit. There you can see Kente-weaving (in Adanwomase) or the dyeing of Adinkra-cloth (in Ntonso). To satisfy one of my WHS-goals of this trip, we also included the Besease shrine. It is located near Ejisu, 20 km east of Kumasi. The building is whitewashed on the outside and includes a very steep thatched roof. It originally dates from ca. 1850, but it was fully restored in 1998. There’s a 2 cedi’s entrance fee, collected by a caretaker who didn’t seem to speak English but clearly loves guests and being photographed. After the restoration, the building was turned into some kind of museum. There are photographic displays on its walls of other traditional buildings, and good explanations in English. The whole compound is quite small, so it is kind of an underwhelming experience. You’ll have to try hard to spend more than 10 minutes inside. Don’t overlook the fetishes that lie around in the courtyard: there’s a tortoise for example, and strings of sheep and goats’ vertebrae (from sacrificed animals). Women who can’t get pregnant are said to still visit the shrine. The shrines obviously are part of a living tradition that now almost has gone. However, they have been included in the World Heritage List for their vernacular architecture. A wonderful feature are the symbols carved into the clay of the interior walls. Visited March 2014, the easiest shrine to get is Ejisu Besease - in fact located in Besease village (there is public transport from Kumasi), the only shrine that is well known (to locals) as well as promoted (Ghanaian Tourist Board - Kumasi Branch), other places are more difficult to be visited. While in Besease it is possible to visit 3 other shrines that are located quite close. Aduko Jachie is located just north of main Kumasi - Accra road (Bradt guide shows exact location), there are no plates nor any other marks of the village. The shrine is located in the northern part of the village (unnoficial entrance fee is 15 Cedi quite a lot comparing to 4 Cedi in Besease). The whole building looks quite usual from the outside (just like surrounding other houses), courtyards preserves some Asante ornaments - most of them in poor condition. In official whc.unesco.org webiste it was mistakingly named Adarko Jachie. More close to Kumasi lies Kentikrono, some 5-6 km from Aduko Jachie, also just nort of the main Kumasi - Accra road. The shrine lies in eastern part of village - ask for Asante shrine or Ghana Museum as the locals call it. Some ornaments are placed outside the building (photo above), more are in the courtyard. Unfortunately whan I was there the building was locked (as locals say the guy responsible for the shrine works in Kumasi). In official whc.unesco.org webiste it was mistakingly named Kentinkrono. Another shrine is located some 5 km south of Ejisu, Atia Kusia Kwame shrine in the village of Edwenase. I haven't been there personally but the site is well known in the area (photos are available also inside Besease shrine). I visited the shrine at Besease, which bears testimony to the once impressive Ashanti Kingdom, as you can see on the photos showcased there. I think the stories its walls tell are what gives this site its meaning and authenticity mark, as the site itself might be overlooked by some tourists. It's unfortunate though that UNESCO has not given attention to other sites around the area which I believe, even if they have post-colonial influences, could also be considered the last remains of a culture that is slowly degrading. I went to Aburi to take a look at lake Bosomtwi, and it was then when I really felt the declaration should encompass a wider range of cultural assets. Further efforts should be made to protect the small towns around Kumasi too. In conclusion, I think focusing on the shrines as living proof of Ashanti's people traditions and values is a little reductive to be honest, and real measures to enlarge the declaration or nominate more sites should be taken. 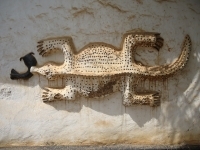 We visited the Ashanti Shrine at Besease in Nov 2010. Our research (the Nomination File, the Web and the Bradt Guide) indicated that it was the easiest and best of the 10 (or 13?) shrines to visit from Kumasi and I have no reason to doubt this judgement. We traveled by coach from Accra to Kumasi and, as we were very short of time, arranged to be dropped off at the village of Ejisu on the main road about 20kms short of Kumasi. The shrine his signed from the road and is set back around 200 yards on the left facing Kumasi. The old man who is "guardian" (the same guy as in Els's review and photo) and can open up isn't there all the time and will probably have to be fetched from the village somewhere but locals in shops/stalls nearby the shrine seem to know where to get him. We were warned that he might be "some (African??) time" but in our case they found him in around 10 minutes. He expects a tip on top of the entrance of course so he has good reason to come! An hour is enough to see the shrine and have the old man "doing" his grass skirt show (said skirt is hanging ready on one of the walls!). As Els says, the old guy doesn't speak English but a local school-boy teamed up with us to explain the libation ceremonies etc which were not really covered by the English wall signs. These take place in front of the sacred tree (photo). It might have been nice to have had a taxi for a day and to have visited a few more of the shrines there are others on the Ejisu side of Kumasi – but more to “experience” Ghana’s village life and interact with the locals than because Besease lacked anything which such shrines have to offer. The shrine’s fabric looked in reasonable condition – the roof possibly needed rethatching but, no doubt, this is normal every few years for such structures. But as a “tourist attraction” it was very low key (not that this should necessarily be regarded as a negative!!). A couple of signs advertising its UNESCO status lay rusting on the ground alongside the building. Kumasi is a large city (pop c 1.5 million) and its traffic is chaotic. Having reached the centre and your hotel you might be tempted to stay there for its sights (Market, palace etc). The Besease shrine is pretty low key but having reached Kumasi it is worth going back out to take it in I feel. Incorrect UNESCO 'Number of locations': No of locations not clear. We know that between 10 and 13 buildings were inscribed. Whilst some may be "adjacent" to and therefore potentially in the same "location" as another, others are widely scattered around or many kms from Kumasi and therefore must be separate "locations"